China has confirmed that a second Canadian citizen has been detained under suspicion of endangering China's national security, in an apparent retaliation for Canada's arrest of a high-ranking Chinese tech executive. 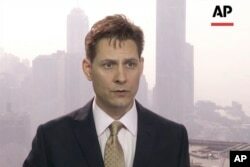 Foreign Ministry spokesman Lu Kang told reporters Thursday in Beijing that business consultant Michael Spavor and former diplomat Michael Kovrig were both detained Monday on suspicion of "engaging in activities that endanger the national security of China." Lu said the two Canadians legal rights are being "safeguarded." Canada's foreign ministry said Ottawa was aware of the second detention and that it had raised the issue "directly with the Chinese authorities." The official news outlet for the northeastern province of Liaoning said Thursday that Spavor was placed under investigation by state security forces in the city of Dandong. Spavor is director of Paektu Cultural Exchange, an office that arranges sports and educational exchanges with North Korea. He has served as a translator and facilitator for retired National Basketball Association star Dennis Rodman's visits to North Korea, and has personally met with leader Kim Jong Un. Kovrig, who was detained in Beijing, is the North East Asia senior adviser for the International Crisis Group, which researches peaceful solutions to global conflicts. He served Canada as a diplomat to Beijing, Hong Kong and elsewhere from 2003 to 2016. The arrests of Kovrig and Spavor occurred a little more than a week after Canadian police arrested Chinese telecom executive Meng Wanzhou at the Vancouver airport on a U.S. warrant. She is accused of violating U.S. sanctions on Iran. A U.S. senator told VOA's Mandarin Service that the arrests seem like retaliatory moves by China. "I don't know the details, but the reason that the Chinese government gave for their arrest that was reported didn't sound to me a real reason. And it sounded more like a retaliation," Senator Jeanne Shaheen, a member of the House Foreign Relations Committee, said Thursday. This TV image provided by CTV shows Huawei Technologies Chief Financial Officer Meng Wanzhou as she exits the court following the bail hearing at British Columbia Superior Courts in Vancouver, British Columbia, Dec. 11, 2018. A Canadian judge freed her on bail late Tuesday while she awaits a hearing on extradition to the United States. Meng must remain in British Columbia and live in a house owned by her husband. She will also be under 24-hour surveillance. Meng is chief financial officer of Chinese telecommunication giant Huawei Technologies, a company founded by her father that is one of the world's biggest manufacturers of mobile phones. Her family is worth billions of dollars. U.S. officials say Meng lied to banks about Huawei's control of Hong Kong-based Skycom, a company that allegedly sold U.S. goods to Iran in violation of U.S. sanctions against Tehran. If convicted in the United States, Meng faces up to 30 years in prison. Her arrest has infuriated China, which called it "extremely bad." China summoned the U.S. ambassador to lodge a formal protest. U.S. President Donald Trump said he would intervene in the case against Meng if it means reaching a trade deal with China. "Whatever's good for the country, I would do," Trump told Reuters on Tuesday. "If I think it's good for what will certainly be the largest trade deal ever made, which is a very important thing. What's good for national security, I would certainly intervene if I thought it was necessary." White House Bureau Chief Steve Herman and VOA's Mandarin Service contributed to this report.